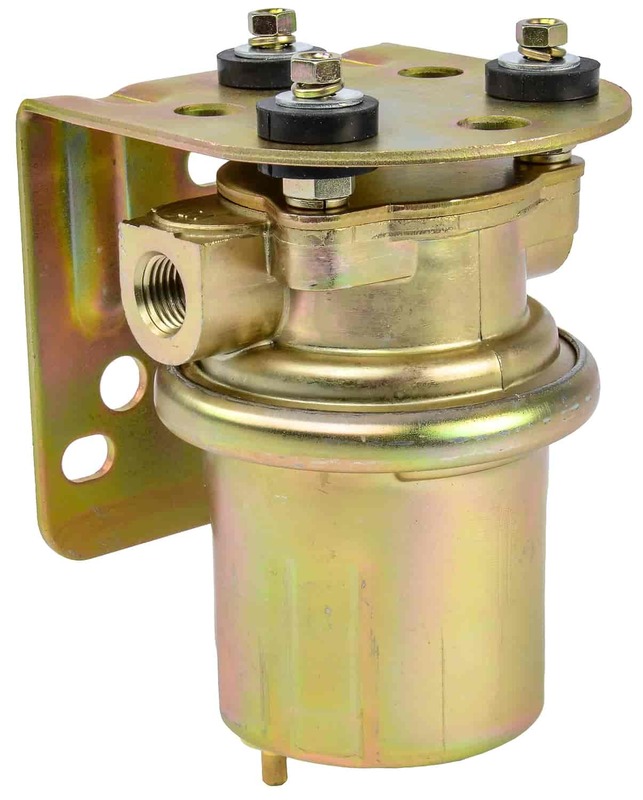 P4594 - Carter Universal Marine Electric Fuel Pumps is rated 3.8 out of 5 by 12. Rated 5 out of 5 by K9Wolf from Best pump Best pump for adding auxiliary tank to your diesel HD truck. I use this pump to transfer diesel fuel from an auxiliary tank to the factory tank. Works great. Rated 5 out of 5 by Matt 87 from Super Reliable Bought on of these pumps early spring of 2000. After almost 18 years of use it finally quit. Ran race gas, pump gas, diesel through it and even not recommended used it to transfer alcohol from drum to can for race car often. Even used it to pump water out of gas tank once, also not recommended. Tough pump. Rated 5 out of 5 by alanwrench69 from whisper quiet This pump is probably the quietest external pump I have ever been around. Pressure and volume consistent from idle to WOT. Pump feeds a 780 cfm Quick Fuel dual line 4bbl on top of a 390 Ford. Quiet , consistent, reliable, and affordable!! Its hard to beat a Carter !! Rated 5 out of 5 by Lbrown from Good street pump Install was easy. Had all hardware that I needed. I have used Carter products for a long time and they are still great. Rated 5 out of 5 by LTRacer from Long life and very dependable I've used these on my 11 second drag cars for about 15 years now and have had great success. Rated 5 out of 5 by rheevs from Easy To install comeswith all the needed fittings. I bought this to replace a 20 year old one on my jeep. The old one had dried out and started to leak because the Jeep has been sitting idle for 15 years. It supplies enough fuel for the Holley 650 double pumper carburetor. Rated 4 out of 5 by oldguy4033 from plugins need help I installed over Christmas my place to mount not great but the pump worked out fine the plugs did not stay on well used a wire tie to fix this other than that great and will buy another next time I need one. Rated 4 out of 5 by Bradley from Everything as advertised for this fuel pump! It was a great price and shipment was better than most. I have not had an opportunity to install, but I'm sure it will work fine. Time will tell! This pump is not made to be used with E85. This is a marine pump and would need to be mounted where the manufacturer specifies its location. This is not compatible with the 6.5 diesel. This could be used to remove the fuel from the other tank. Yes, this can be used for diesel fuel. The diameter is approximately 3&quot;. I would not recommend this fuel pump unless you plan on producing less then 425hp, more then likely you will really need about a 110-140 gph fuel pump for a mild sbc with a 671 blower.